When I was a kid, I used to go swimming in the pond near my house. On occasion my Dad would come with me and caution me not to get the green pond algae in my mouth. Little did I know that years later I would use it to save my patients’ lives. Scientists have long known that many primitive peoples around the planet dried and consumed spirulina as food, or with their food. It grows naturally and has been used as food from Northern Africa to Asia to the Americas. 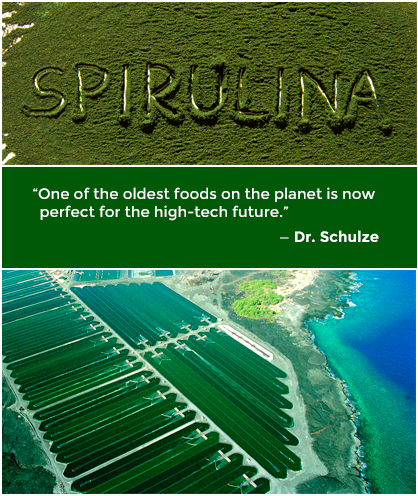 Spirulina was used by the ancient Aztec civilization and used 1,000 years ago as food by the tribes of North Africa, but it wasn’t until the last century that anyone really bothered to look at it and analyze it, and was it a big surprise. Our organic spirulina comes from the big island of Hawaii, the Kona side that may get more sunshine than almost anywhere else on earth. This spirulina supplement is so dark-green it almost looks black; this is due to the constant sunshine that increases the beta-carotene content of our spirulina. It is grown in beds carved out of volcanic lava, with pristine pure mineral-rich water pumped from 2,000 feet below sea level. It is then freeze-dried using a patented natural chilled water method. This particular spirulina supplement has a soft cell wall, which makes it very easy to digest and assimilate. I have been researching and using organic spirulina for over 35 years and as far as I am concerned this is the best spirulina powder in the world. Spirulina is now accepted as such a nutrient-dense super food, it has been approved as space food by NASA and other agencies for space travel and long-term space living. Now one of the oldest foods on the planet is proving to be perfect for the high-tech future. Because it is a single-celled plant, it assimilates with almost no work from your digestion. In fact, your body begins to assimilate it right in your mouth and into your bloodstream. TRY ANY OF OUR SUPERFOOD PLUS FAMILY OF PRODUCTS TODAY! Copyright © 2017 American Botanical Pharmacy. All Rights Reserved.